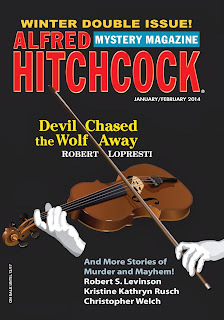 I am delighted to report that the January/February 2014 of Alfred Hitchcock's Mystery Magazine is out this week and features my 24th appearance in that fine periodical. Even better, it marks my third chance to grace the cover (and what a perfect illustration it is!). "Devil Chased The Wolf Away" is a short story but the history of how it came to exist is a long story, so you might want to fortify yourself with a cup of coffee or something. I'll wait. About fifteen years ago I attended a concert by a man who had been considered a master musician. The problem was he was long past his prime, and it showed. He was confused and his playing was clumsy. That would have been bad enough, but worse was the fact that his accompanyist, the man who had been driving him from show to show, was clearly fed up, and was rude and disrespectful. This made the show quite unpleasant. And as I watched it, being the person I am, I found myself thinking: is there a story here? A crime story? By the time the show was over I had invented Cleve Penny, an over-the-hill old-time fiddler from Kentucky. 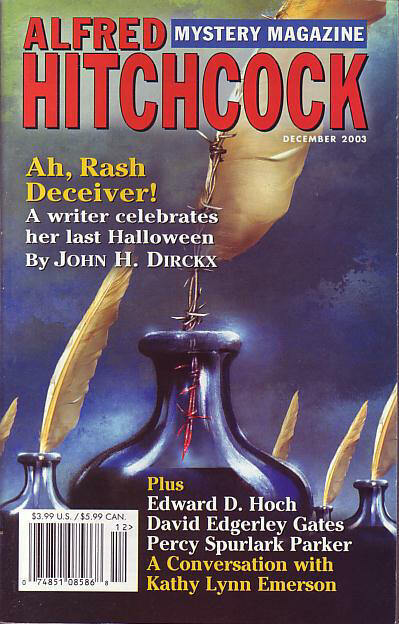 His tale, "Snake In The Sweetgrass," appeared in the December 2003 issue of Hitchcock's. I thought it was my best story and some people seemed to agree. Several urged me to write about Cleve again, but I didn't want to. I was afraid that what seemed magical the first time might turn out to be just slight of hand the next time around. Besides, if I kept dragging my old guy around from stage to stage, wasn't I being like that accompanyist? So I made up my mind not to write a sequel to "Snake." Then Bruce Molsky came to town. But a few years ago Molsky performed here with a brother and sister act, only one of whom was old enough to drive, and watching him interact with those talented youngsters I had a sudden thought: wouldn't it be fun to have Cleve Penny work with some children? I thought it would. Not long before this my family had visited Chicago for the first time, which included a pilgrimage to the Old Town School of Folk Music. The School was founded in 1957 and has been offering lessons, concerts, and jams ever since. So I invented the Cornheim School of Folk Music, and installed Cleve Penny as guest Artist in Residence. Then I gave the school a problem and invited Cleve to take his unique approach to solving it. But I had another problem. "Devil" is in some ways a direct result of the events in "Snake." Cleve's actions in the second story are heavily influenced by what he did in the first. I can't assume that everyone who reads "Devil" will have read "Snake," much less remember it a decade later. So how do I slip in the backstory? I actually got into an interesting discussion on this subject with mystery writer Neil Schofield and wrote about it at Criminal Brief. I think I licked that problem, but Linda Landrigan, editor of Hitchcock's, offered an even better solution. As I said last week, you can download a free podcast of "Snake." I highly recommend you read/listen to it before you dig into "Devil." You will enjoy them both more that way. I think I'm done with Cleve Penny now, and he can settle into a well-deserved retirement. But I have learned to never say never.